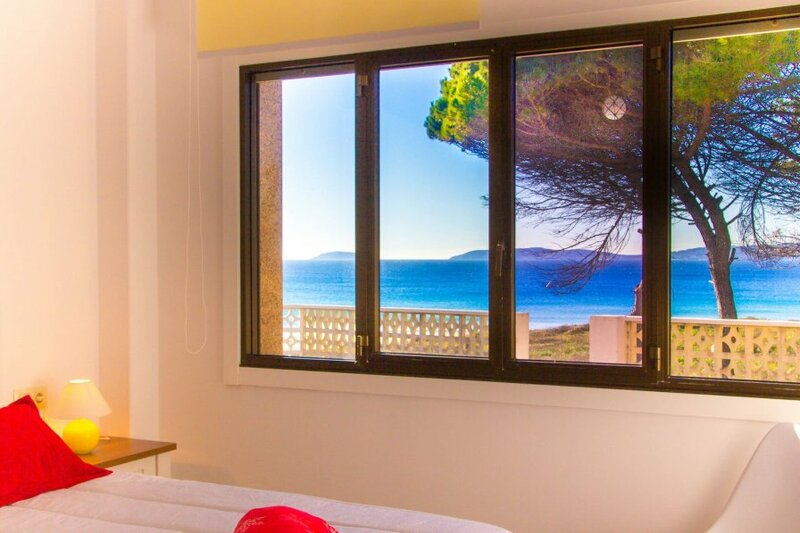 Spacious and bright apartment located above the beach of Montalvo, one of the most famous and beautiful beaches of Galicia. The apartment on the ground floor has 3 large bedrooms, 2 bathrooms, a large fully equipped kitchen and a lounge with terrace, to enjoy the best sunsets and views to the beach, ocean and islands. The house has private parking and direct access to the beach. Perfect for a relaxing holiday and to enjoy the sun, the beach, food and hospitality. The property is only 1.5 km of the tourist center of Sanxenxo and the fishing village of Porto Novo, known for its fine cuisine, climate and beautiful beaches. In Sanxenxo you can do a lot of activities as, karting, water sports, horseback riding, boat rentals, guided tours to the island of Ons, Casino Toxa, prestigious golf courses and Monte Toxa Castrove. The house is located in the municipality of Sanxenxo (the main tourist center on the coast of Galicia for its white beaches, scenery and cuisine). There is a special microclimate and beaches such as Montalvo, Bascuas, Silgar, Major, Paxariñas, Caneliñas, Baltar and Lanzada, and other small coves are within a radius of 3 km.